An electron micrograph showing a section of a liver cell. Glycogen deposits are shown as accumulations of electron-dense particles (arrows). The granules contain both glycogen and the enzymes of glycogen synthesis and degradation. 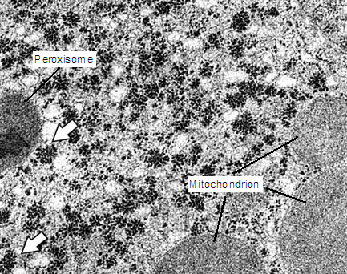 Also labeled are a peroxisome and three mitochondria, which are two types of compartments within the cell (organelles). Glycogen is the principal storage form of glucose (Glc) in animal cells, though it is also found in various species of microorganisms, such as bacteria and fungi. It is a large, branched polymer of linked glucose residues (portions of larger molecules) that can be readily mobilized as an energy source, increasing the amount of glucose immediately available to the organism (1) between meals and (2) during muscular activity. Since the brain relies on glucose as its preferred fuel, the ability to maintain a steady supply of glucose, which is the major sugar circulating in the blood of higher animals, is crucial to survival. Glycogen is found in the form of granules in the cytosol, the internal fluid of the cell. About three-fourths of the body’s glycogen supply is stored in muscle cells. However, liver cells (hepatocytes) have the highest concentration of glucose (a maximum of approximately eight percent in liver versus one percent of the muscle mass of an adult male human being). Small amounts of glycogen are also found in the kidneys, and even smaller amounts in certain glial cells in the brain and in white blood cells. Liver cells play a key role in regulating the blood glucose level as they can either break down glycogen (glycogenolysis) to release glucose into the blood or withdraw glucose from the blood and store it by synthesizing glycogen (glycogenesis). It is noteworthy that glucose is not a major fuel for the liver, which mainly utilizes keto acids. The liver cells, therefore, perform the glucose storage and release primarily for the benefit of other organs. This reflects the principle of dual purposes, whereby the components of living organisms work together harmoniously because they not only exhibit an individual purpose oriented toward their own self-maintenance and development, but also serve a purpose for the whole. In skeletal muscle, glycogen is an energy reserve that can be tapped during exercise. Muscle cells lack the ability to release glucose into the blood, so their glycogen store is destined for internal use, powering muscle contraction during strenuous activity. Glycogen-storage disorders are a type of inherited metabolic disease resulting from deficiencies of the enzymes that participate in glycogen metabolism. Symptoms vary in type and severity, ranging from exercise intolerance to low blood sugar and kidney disease. Certain forms of glycogen-storage disorders cause cardio-respiratory failure or liver failure in affected infants. The structure of glycogen. Most glucose residues are linked by α-1,4 glycosidic bonds (labeled at top). Approximately one in ten glucose residues form α-1,6 glycosidic bonds, creating a branched structure (green). The non-reducing end-branches (red) facilitate glycogen's interaction with enzymes involved in its synthesis and breakdown. Glycogen is a highly branched polymer of about 30,000 glucose residues. It has a molecular weight between 106 and 107 daltons. Given its size, glycogen is considered a polysaccharide: i.e., a large carbohydrate constructed out of hundreds or thousands of linked monosaccharides (such as glucose). Linking the monosaccharide components of glycogen are glycosidic bonds, chemical bonds that form between the hemiacetal group of a saccharide and the hydroxyl group of an alcohol. Specifically, most of the glucose units are linked by α-1,4 bonds, in which the carbon-1 of one sugar molecule is linked to the carbon-4 of the adjacent molecule. In the alpha configuration, the oxygen atom is located below the plane of the sugar ring. Approximately one in ten glucose residues also forms an α-1,6 glycosidic bond with an adjacent glucose, which results in the creation of a branch. Glycogen has only one reducing end and a large number of non-reducing ends with a free hydroxyl group at carbon-4. The branches increase the solubility of glycogen and make its sugar units accessible to the enzymes involved in glycogen metabolism, which nest between the outer branches of the glycogen molecules and act on the non-reducing ends. Therefore, the many end-branches of glycogen facilitate its rapid synthesis and breakdown, making it a readily mobilized source of energy. Starch, which plays a similar energy-storage role in plants, can also exist in a branched form called amylopectin, though it has a lesser degree of branching than glycogen (about one in 30 glucose residues form α-1,6 bonds). 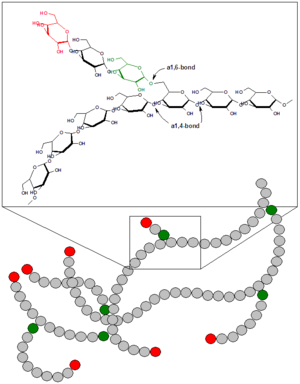 In contrast, cellulose, the other major polysaccharide in plants, is an unbranched polymer of glucose, in which β-1,4 linkages form very long, straight chains. This closed structure is suited to the structural role of cellulose, a major component of plant cell walls, whereas the open helices of glycogen and starch, which are nutritional molecules, provide easy access to stored glucose. The liver is a major control site of blood glucose levels; it responds to hormonal signals that indicate reduced or elevated amounts of glucose in the blood. The synthesis and breakdown of glycogen in the liver thus serves as a means for maintaining a steady supply of fuel for organs such as the brain, allowing glucose to be stored or released depending on the energy needs of the organism. As a carbohydrate meal is eaten and digested, blood glucose levels rise, and the pancreas secretes the hormone insulin. The hepatic portal vein delivers glucose-rich blood from the digestive system to the liver’s hepatocytes; insulin, also carried in the blood, acts on the hepatocytes to stimulate the action of several enzymes, including glycogen synthase, involved in the synthesis of glycogen. Glucose molecules are added to the chains of glycogen for as long as both insulin and glucose remain plentiful. In this postprandial or "fed" state, the liver takes in more glucose from the blood than it releases. The hormones glucagon, produced by the pancreas, and epinephrine, secreted by the adrenal gland, serve in many respects as a counter-signal to insulin. When blood glucose levels begin to fall (about four hours after a meal), they stimulate the breakdown of glycogen. The freed glucose is then released from the liver into the blood. For the next eight to 12 hours (for example, during an overnight fast), glucose derived from liver glycogen will be the primary source of blood glucose to be used by the rest of the body for fuel. Although liver cells maintain a high concentration of glycogen, the liver meets most of its own energy needs through keto acids derived from the breakdown of amino acids. The liver's role in glycogen metabolism is to synthesize and degrade glycogen for the benefit of the organism as a whole. Muscle cells lack the enzyme glucose-6-phosphatase, which is the enzyme that enables liver cells to export glucose into the blood. Therefore, the glycogen stored in muscle cells is utilized internally rather than shared. Other cells that contain small amounts of glycogen use it locally as well. Glycogen in muscle cells functions as an immediate source of available glucose during bursts of activity, such as a 100-meter sprint. When the energy needs of the cell outpace its limited oxygen supply, ATP (the "energy currency" of the cell) is produced in part by the anaerobic glycolysis of glucose derived from muscle glycogen. Glycolysis is a metabolic pathway by which glucose may be broken down to pyruvate in the absence of oxygen. Although the complete oxidation of glucose in the presence of oxygen (oxidative phosphorylation) produces about 18 times the amount of ATP, glycolysis occurs at a rate approximately 100 times faster than aerobic respiration. During a period of brief, intense exertion, the energy requirement is to generate the maximum amount of ATP for muscle contraction in the shortest time frame. However, a longer period of activity requires at least the partial use of ATP derived from oxidative phosphorylation, which explains the slower pace of a 1,000-meter run. The liver may also work in tandem with skeletal muscle in times of exertion. The Cori cycle refers to the recycling of lactate or lactic acid produced by muscle during anaerobic metabolism. The lactate is converted to glucose by the liver. This permits the regeneration of NAD+ required for glycolysis to continue. The lactate diffuses into the blood and is taken up by the liver, which oxidizes it back to pyruvate. Most of the pyruvate is then converted to glucose (via gluconeogenesis). This glucose circulates in the blood, where it can be used by muscles if needed or stored as glycogen. The Cori cycle allows the muscles to continue focusing exclusively on the production of ATP while the liver handles the lactate produced in muscle. The cycle also prevents lactate acidosis by removing lactate from the blood. Otherwise, pH would fall as the buffering capacity of blood is exceeded. Since the human body is unable to hold more than approximately 2,000 kcal of glycogen, marathon runners commonly experience a phenomenon referred to as "bonking" or "hitting the wall" around the 20-mile (32-km) point of a marathon. Symptoms of this condition, which signals the depletion of glycogen stores, include general weakness, fatigue, and manifestations of hypoglycemia (low blood sugar), such as dizziness and even hallucinations. This rapid drop in performance results from a shift in the fuel supply: as glycogen stores diminish, ATP must also be generated in part from fatty acid oxidation, which is a slower process than the oxidation of glycogen. The simultaneous utilization of both fuels allows for a balance between endurance and speed, preserving enough glucose to fuel the runner's final push to the finish line. Carbohydrate loading is used to ensure that the initial glycogen level is maximized. This technique consists of increasing the intake of complex carbohydrates in the final three days preceding the event. Consuming food or drink that contains carbohydrates during the exercise will replenish the supply of glucose. This is a requirement for very long distances; it is estimated that Tour de France competitors receive up to 50 percent of their daily caloric intake from on-the-bike supplements. Decreasing the intensity of the exercise to the so-called "fat-loss" level (a heart rate of 130 beats per minute for a 30-year-old athlete) will lower both the energy requirements per unit of distance and the fraction of the energy that comes from glycogen. The most common disease involving abnormal glycogen metabolism is diabetes mellitus, which is characterized by persistent variable hyperglycemia (high blood sugar levels), resulting either from a deficiency of insulin or from an inadequate response by the body's cells to insulin. As mentioned above, insulin is the principal control signal for the conversion of glucose to glycogen for storage in liver and muscle cells. Lowered insulin levels result in the reverse conversion of glycogen to glucose by the liver when blood sugar levels fall. With the system out of balance, the liver then releases more glucose into the blood than can be utilized by other cells. von Gierke's disease (Type I) is the most common of the glycogen storage diseases. It results from a deficiency of the enzyme glucose-6-phosphatase, which in turn impairs the ability of the liver to produce free glucose from glycogen stores and through gluconeogenesis. Since these are the two primary metabolic mechanisms by which the liver supplies glucose to the rest of the body during periods of fasting, hypoglycemia is symptomatic of the disease. Reduced glycogen breakdown results in increased glycogen storage in liver and kidneys, causing enlargement of both organs. Frequent or continuous feedings of cornstarch or other carbohydrates is the principal treatment. Pompe disease (Type II) is caused by a deficiency in a lysosome-specific enzyme of glycogen breakdown called acid alpha-glucosidase (GAA). It is the only glycogen storage disease involving a defect in the lysosome, an organelle that contains digestive enzymes that breakdown macromolecules such as glycogen. The resulting build-up of glycogen causes progressive muscle weakness (myopathy) throughout the body and affects various body tissues, particularly in the heart, skeletal muscles, liver, and nervous system. A disorder involving glycogen metabolism in muscle is McArdle's disease (Type V). It is characterized by a deficiency of myophosphorylase, the muscle isoform of the enzyme glycogen phosphorylase. This enzyme participates in the breakdown of glycogen so that it can be utilized within the muscle cell. Persons with this disease experience difficulty when their muscles are called upon to perform relatively brief yet intense activity. The inability to break down glycogen into glucose leads to an energy shortage within the muscle, resulting in muscle pain and cramping, and sometimes causing serious injury to the muscles. In addition, the breakdown of muscle tissue can indirectly lead to kidney damage. Anaerobic exercise must be avoided but gentle aerobic activity is beneficial. Chen Y.-T., and A. Burchell. “Glycogen storage diseases.” In C. R. Scriver, A. L. Beaudet, W. S. Sly, and D. Valle (eds. ), The Metabolic Basis of Inherited Disease, 7th edition. New York: McGraw-Hill, 1995. Cornblath M, and R. Schwartz. “Disorders of glycogen metabolism.” In M. Cornblath and R. Schwartz, Disorders of Carbohydrate Metabolism in Infancy, 3rd edition. Cambridge: Blackwell, 1991. Tsalikian E., and M. W. Haymond. “Hypoglycemia in infants and children.” In F. J. Service, Hypoglycemic Disorders: Pathogenesis, Diagnosis, and Treatment. Boston: G. K. Hall Medical Publishers, 1983. This page was last modified on 9 September 2008, at 20:02.